Just as you have to renew your regular medical prescriptions with your medical doctor your ESA letter for Flying has to be renewed every year. It’s not that it “expires”, but federal law requires that it be dated within a year from the date of your flight. We have simplified the renewal process so that a new ESA letter can be issued for a reduced price. 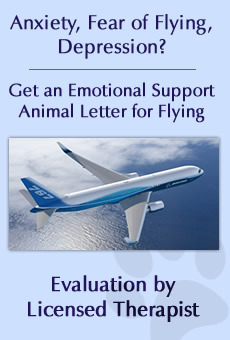 If there have been no material changes in your condition since the last time you were evaluated you can complete a simple form and a therapist will confirm your request for a renewal and issue a new ESA letter for Flying. The fee for such a renewal is $50. If you have already renewed your original letter, or if more then 2 years have passed since your original letter was issued, a re-assessment is necessary . The fee for re-assessment is $95. After you make payment, a link to the Renewal form will be sent to you in your receipt. Complete the form and your renewal will be processed in 24 hours. In the event there have been changes to your condition you will have to speak to a therapist. Please contact the office (info@esaletter.com) and special a arrangements will be made to have you re-assessed. The Fair Housing Act has no dating requirement and therefore ESA letters for Housing do not need to be renewed. Many of our clients move from place to place using the same letter. However, if you are moving to a new building and more than one year has passed since the issuance of your original letter, any request for a renewal or completion of a special building or school form will require a re-assessment. If the request for a new letter is made within the first year then only a renewal fee is required. A re-assessment will also be necessary if more then a year has passed since the issuance of your original letter and you need a second letter (housing or flying) that you did not request initially. If less than a year has passed your request will be processed as a renewal and no new assessment will be required.